MICKVE ISRAEL’S MUSEUM: Uriah Levy’s great-great grandfather, Samuel Nunes Ribiero, was a prominent, well-to-do Portuguese physician who was born in 1668 and fled the Spanish Inquisition with his family. The family first went to London, then boarded a ship in the spring of 1733 and landed in Savannah, Georgia, on July 11, six months after James Oglethorpe had started the colony named after his patron, King George II. Dr. Samuel Nunez, as he came to be known in the United States, became one of the most accomplished and well-known founders of the colony of Georgia. Dr. Nunez helped found the Mickve Israel Synagogue in Savannah in July 1735, which to this day on commemorative occasions still uses the Torah (in the case in the above) that was brought to Savannah by the Jews who landed in Savannah in 1733. Which brings us to the newly re-designed Gutstein Museum at Historic Congregation Mickve Israel which opened its doors in last July. “We’ve been around for so long, and we’ve been a part of not only Savannah’s history, not only of Georgia’s history, but of our country’s history,” Bubba Rosenthal, Mickve Israel’s vice president, told a local reporter at the museum’s ribbon cutting. The event also commemorated the congregation’s 283rd anniversary. It is the third-oldest Jewish congregation in the country. THE UPPER FLOORS: An article by Diane Ehrenpreis, the assistant curator of decorative arts at Monticello, in the Winter 2015 issue of Antiques & Fine Art magazine (afamag.com) offers an excellent look at the recently restored rooms on Monticello’s second and third floors in words and photographs. High-quality work has gone into the restoration and furnishing of the upstairs rooms. The rooms include the North Octagon Bedroom—which has been restored to its time as the room of Jefferson’s sister, Anne Scott Jefferson Marks, who lived at Monticello from 1812-28—and the north bedroom on the third floor, called the Double Alcove, where Jefferson’s grandsons lived. Then there is the famed third floor Dome Rome (above), which Jefferson designed based the dome on the Temple of Vesta in Tivoli. It served as a bedroom and a storage room during Jefferson’s time. 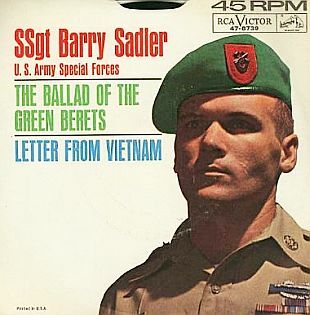 EVENTS: My next speaking event is not until February since, for the last three months, I have been in full-time writing mode for my next book, a biography of Barry Sadler, the U.S. Army Sergeant who wrote and performed “The Ballad of the Green Berets.” The book will be published in November.